Spoiler alert: This is how this story will end. ST. ALBANS, VT — “Whoa whoa whoa! Bad noise! Bad noise!” is not really what you want to hear from a cop in a deserted mall parking lot at nearly 1 a.m. Frankly, even “Do you realize how fast you were going, ma’am?” would have been better. When I left Montreal around suppertime on the night before Halloween, I didn’t foresee having any contact with police. I don’t, you know, because I don’t speed and I signal my turns and I’m a middle-aged white lady, so I don’t get stopped randomly. I was just hopping across the border for a few hours to pick up Melani and the baby at Burlington airport after their sojourn in Colorado Springs. 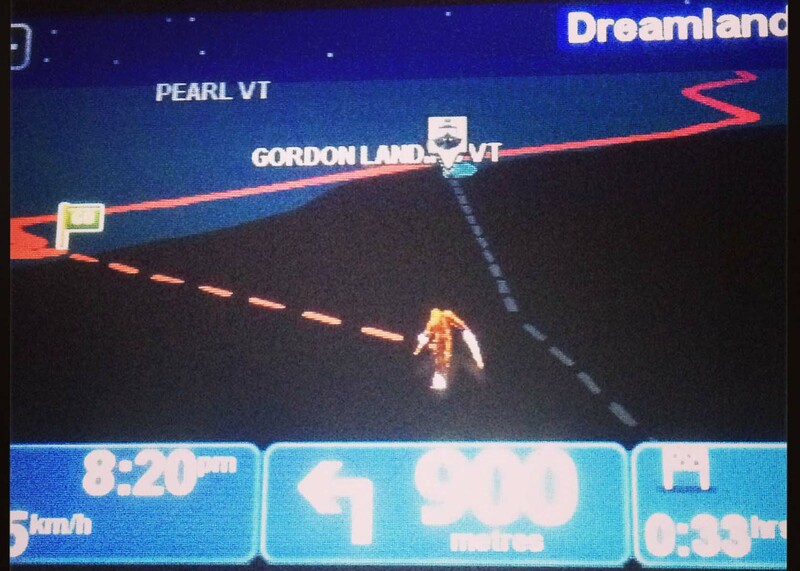 Alpha the GPS decided — in the dark, without warning me — that we were about to take a ferry in Vermont. Once my ladies were safely back in my possession, I appeased Alpha by letting him choose the route home. It was late, and the Champlain is slightly less hateful once the traffic’s gone. Joe the truck started vibrating a few miles south of the border. It was a gentle shake that worked its way up to jiggle my arm fat and cause mild emotional distress. “It’s just the road,” Melani assured me, because she knows how much I worry. Nevertheless, I left the highway and when I turned the wheels to enter a gas station, Melani said the genle click-clunk just sounded like I’d run over something. We continued to disagree about severity of the issue—gently, because we’d been separated for a week and we’d missed each other. At the end of the not-argument, I exited the gas station, promptly turned the wrong way and had to make a U-turn in a shopping-mall entrance. Only Joe wasn’t feeling up to a U-turn. He got as far as an L-turn and groaned and yelled like he’s never done before. I love Joe. When he hurts, I hurt. So I cut the engine, sighed heavily and pretended I wasn’t sideways in a mall exit after midnight. Melani was on the phone with triple-A when a pickup and two cars full of men surrounded us on three sides. It could have been the opening scene of a Law & Order: SVU episode, but turned out to be three groups of guys—none of whom knew each other—making sure we were okay and offering to help. They were long gone by the time the bright light filled the car. I had the baby on my lap and thought for a moment that we were about to be alien-abducted together. Then the light started cycling red, white and blue, and let me tell you this: I read this cool cop’s blog and I listen to this jailer podcast, so I know better than to swing my door open in the middle of the night with suspicious cops right behind me. 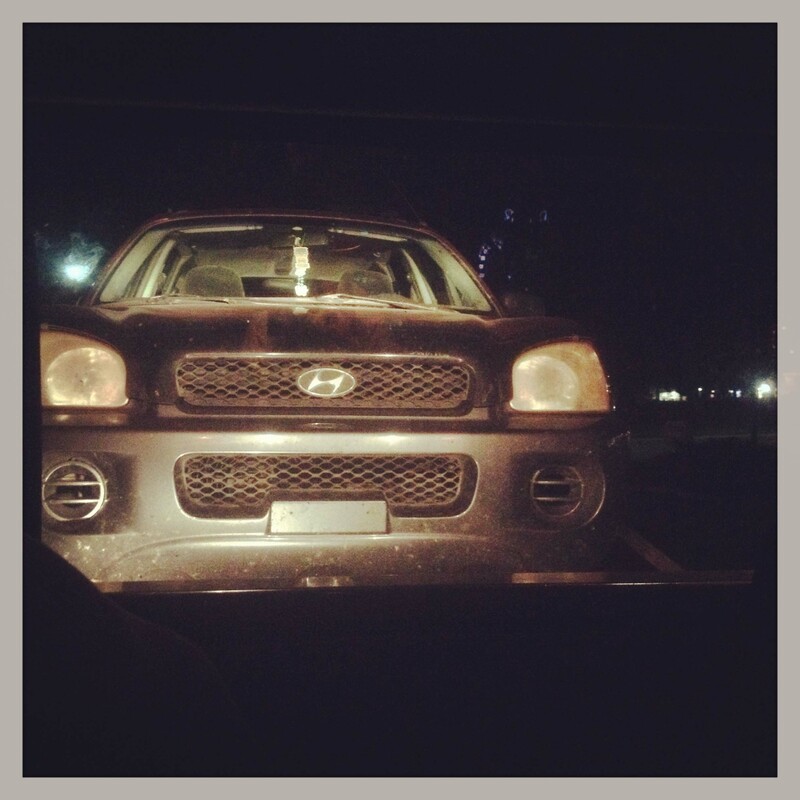 “DO NOT EXIT YOUR VEHICLE,” he bellowed into a megaphone and I froze with embarrassment. He relaxed the moment he’d flashed his light into the car. We’re not a very menacing crew. I explained what happened and he explained that we really couldn’t leave our car sideways in a mall exit, offering to give us a push a little off the road. I did tell him the wheels weren’t happy about having to turn, but he really wanted me moved. He smiled. “It probably won’t even make that noise now that we’re here.” He didn’t say “little lady” out loud, but it sure hung there in the air. I dropped it into neutral and the cops got behind and gave me a gentle push. Wouldn’t make that noise with them there, indeed. Clunk cluck clunk GRIND YELL UNHAPPY. “Whoa whoa whoa! Bad noise! Bad noise!” one of them exclaimed, stepping away from poor Joe as I cut the engine and pulled the parking brake. I wasn’t smug and I didn’t say I told you so. I thanked them for the push to somewhere safe and thanked them again when they said they’d be back to check on us. They parked across the street at the gas station for a while and kept an eye on us. Joe settles in for his tow from St. Albans, Vt., home to Montreal. The tow-truck driver was a darling, but he didn’t have his passport with him. He’d take us as far as the border, he said, and leave us at the duty free. Sounds reasonable, right? But you know us. You know it couldn’t possibly be a warm, brightly lit duty free at a nice big border with lots of traffic and fun things to look at. You just knew it, didn’t you? 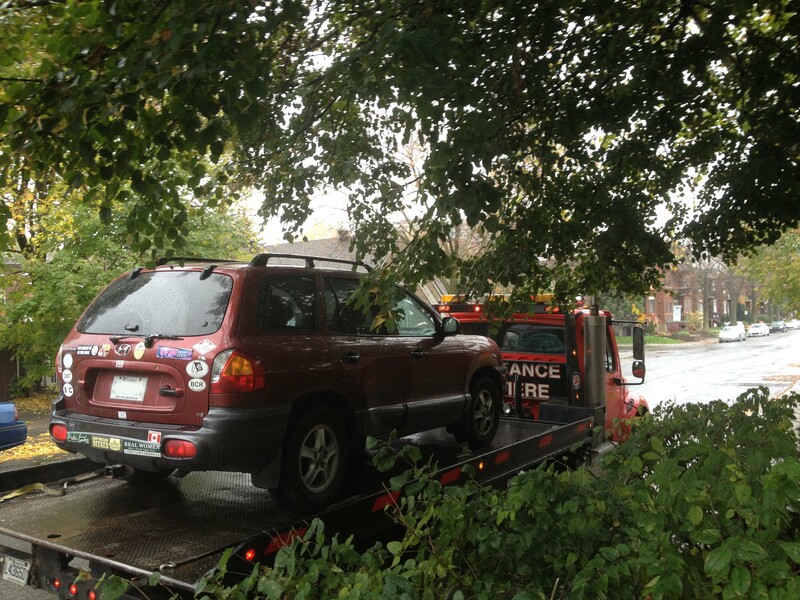 I was a little mad by the time the second tow-truck driver showed up. We’d been told there wouldn’t be enough room in the cab for us and a car seat, so Melani unloaded most of her stuff onto the shadowed, cold dirt of the parking lot and was determined to wait there for her mother, who’d been woken up after midnight and drawn into our chilly drama. Her mother was not answering her cellphone, so we couldn’t explain to her that the duty free probably wasn’t what she was expecting. It was a good distance off the highway, down a twisty, heavily wooded road. It was a small, dark shack with a looping parking area surrounded on three sides by thick black forest and this—this!—is where my bride expected me to leave her for an indeterminate amount of time. The driver was round and baby-faced and earnest. He wanted to talk about cars, and five minutes into the drive he’d determined that I knew just enough about vehicles to be a satisfactory sounding board. “What does her mother drive?” he asked as we approached the boarder. He was squinting toward the U.S. entry, scanning the cars on that side. He shrugged, because she hadn’t gotten there yet, and we speedily crossed the border ourselves, whereupon he continued to tell me about his cars and what he was going to do to them. He asked me again what sort of car Mel’s mom drove and he peered at approaching headlights seriously. When I squealed and matched his excitement, he whipped out his phone and navigated (the highway was dark, but straight and empty) to his demo videos, which I watched the rest of the way home. And though Joe was going to be just fine (he had a broken axle), I made him a silent promise right then that when his time came, he wouldn’t go off to some lonely dump—he’ll be donated for a demolition derby and go out in flames. Here’s my favourite of the tow-truck driver’s videos (or one very similar). The guy in the bottom vehicle controls the gas—the guy up top steers.